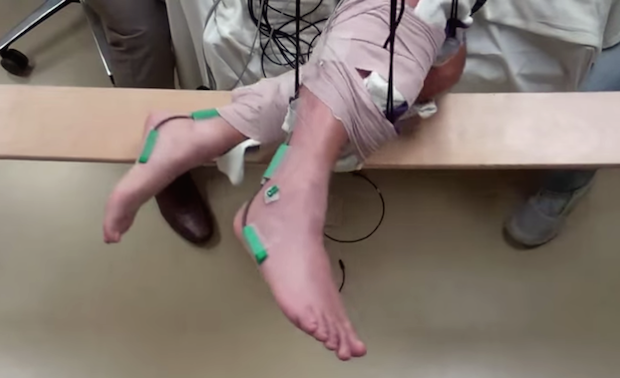 For the first time, doctors have found a way to help completely paralyzed patients regain voluntary movement -- without surgery. "These encouraging results provide continued evidence that spinal cord injury may no longer mean a life-long sentence of paralysis and support the need for more research," Dr. Roderic Pettigrew, director of the National Institute of Biomedical Imaging and Bioengineering at the National Institutes of Health, said in a statement. "The potential to offer a life-changing therapy to patients without requiring surgery would be a major advance; it could greatly expand the number of individuals who might benefit from spinal stimulation," said Pettigrew. "It's a wonderful example of the power that comes from combining advances in basic biological research with technological innovation." In 45-minute sessions that took place once a week, doctors placed the patients' legs in a "gravity-neutral" position attached to braces hung from the ceiling. First, they placed electrodes over the skin of the patients' lower backs, which stimulated nerves that control the legs. In the early weeks, the men could only move their legs slightly, even with electrical stimulation, but gradually gained more capacity. They say the entire therapy process may have helped the men to reconnect some signals between their brain and spinal cord, which retrained their bodies to make partial stepping motions -- without surgery. "It's as if we've reawakened some networks so that once the individuals learned how to use those networks, they become less dependent and even independent of the stimulation," lead author of the original study, Dr. V. Reggie Edgerton, professor of integrative biology and physiology at UCLA, said in a statement. "All patients are going to need something slightly different, and maybe non-invasive stimulation is going to be best in some cases and epidural stimulation in others," said Edgerton. "What we need to do is maximize the clinical tool box that we have so that the physician and the patient can select a therapy that is best for them."